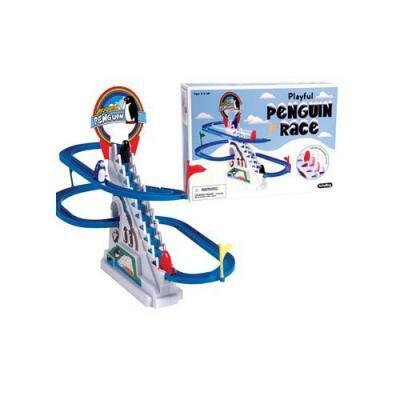 Penguins travel up the moving ladder and slide down the chute to start all over. Watch the penguins escalate up the ladder and shoot down the slide!! penguins climb up the escalator and then glide down the ski slope in time with a penguin sound. Great attention getter. There are 3 penguins, black, red and blue. 1 D battery required, not included. Easy assembly directions included. Perfect for ages 6 and up!